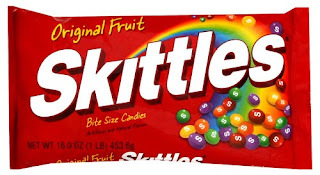 My favorite candy... Skittles ! In all types. Some folks like 'em sweet, some like 'em sour and some even like original and tropical. No matter what flavor, I eat 'em by the handful. Okay! Well! not that often or I wouldn't be able to keep this body of mine in tune. Last night though, I ate a whole huge box at the movies. Sherlock Holmes is a very long movie. It's not often that my husband takes me out the movies. I kinda wanted to see a sweet romantic comedy or something along those lines. I bet it's been about 5 years since we went to see a movie together. We just can't agree on a genre. He likes guy stuff and I don't. So I made him buy me the biggest box they had. I finished the whole box by myself. I didn't even share any of them with my him. What in the world does this have to do with String Quilts? 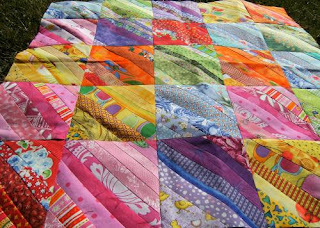 I made this bright and cheerful little quilt last weekend when it was brutally cold here. While I was making it, I was thinking of a clever quilt name for my post or even for a label. So Skittles it is. Today is the first day of bright sunshine and no gale force winds bringing the wind-chill down to 24 degrees. It is a toasty 44. On another subject. Is anyone up for a new challenge? How about if we make a patriotic-themed string quilt to commemorate President's Day. Let's make our Founding Fathers proud. I will pick a winner at random. A neat 2 1/2 inch AccuQuilt Cut sweet treat of americana charm squares. Please leave me a way to notify you if you are my winner. Some of you are following anonymously or have your blog set to private. I don't want you to miss out on such goodness!! Silly It's this MOnday!! February 15th. Remember the banks are closed and no postal service that day!! "Washington's birthday has been publicly celebrated since he was in office, before Abraham Lincoln was even born. Much of the debate over the name of the holiday springs from the fact that state's can follow their own holidays how they see fit and many of them chose to also honor Lincoln, calling the celebration President's Day"
It was in 1968 that the term President's Day came up for legal consideration in the Congress but was shot down, though the holiday was moved to fall between the two President's birthdays. Again in the 1980's there was a resurgence of the term with advertisers which solidfied the holiday name in American culture. Today, few Americans perfer to call the holiday Washington's Birthday in lieu of President's Day. Ack! Stop tempting me with your gorgeous string quilts! I'm determined to work on some of my UFO's before starting something new. Your Skittles String is very yummy!! Delicious colours. Here in Nova Scotia we dont have a winter holiday like some other provinces. BooHoo. There is a big push on to get one though. It is nice that they still want to come home. Sometimes it's just to grab a free dinner, or use my sewing machine, help with a college paper from my husband, or sometimes to figure out what they want to do in life. Okay Linda, I nominate you to organize a grass roots effort and get your parliament to get off their duff. How about a Canadian National Quilter's Day Off? YUM! Love your Skittles quilt! Thanks for the history lesson too!I remember the days when we used to celebrate BOTH Washington's and Lincoln's birthday! Kinda sad now that they're squished together. Hmmm, wonder if I can find some r/w/b strips. I LOVE your Skittles quilt. It's the perfect pick me up to chase away the winter. 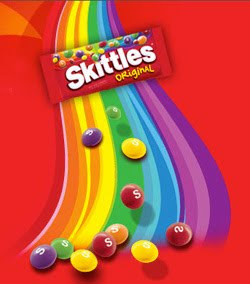 Although I'm not a Skittles fan (except for the sour ones), I'll take inspiration wherever I can get it. Is there a due date on the President's Day quilt? Just this month? I'm in. I got excited at the super-special price of patriotic fabs after the 4th last year. Hi Wendy, I am going to just surprise the winner at random. No special time limit. As you can see, I like to give out freebies. I also love my AccuQuilt Cutter System. I just found your blog through a link on Jeanne's Luv2stitch blog. I have my small phone books ready to take to my sewing room. I have never made a string quilt before, and this looks like a great way to help reduce my stash and use up scraps. 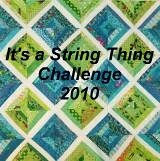 All of the string quilts are wonderful!!!! I love the bright springy colors of your strings..you are inspiring me to do something new! Winter has been so long and drawn out to even include places that shouldn't have snow that we need to focus on bright colors, new patterns and dreamy warm days! Happy Valentine's Day everyone. LOVE the "Skittles" quilt...great idea...I'll have to put it on me "To-Do" list!